Yesterday afternoon, Chief of Staff John Kelly gave a moving press conference that was no doubt intended to quell the controversy over President Donald Trump's phone call to the widow of Sgt. La David Johnson, a serviceman slain during an operation in Niger. During the phone call it was claimed that Trump came across as unsympathetic and used the phrase "he knew what he was getting into." over a speaker, and "politicizing" what happened reporting what was allegedly said to the media. It should be noted that Rep. Wilson's account was confirmed by other family members present during the call. I don't fault Rep. Wilson, a long time family friend, for listening in on the phone call as she no doubt was asked to do so by family members. Hence the use of the speaker. I do, however, agree with Kelly that Rep. Wilson no doubt politicized the phone call, using it to take a shot at the President. However, the reason Wilson was in that position to attack the President on the issue is 100% the fault of the President. Trump is well-known for having attacking Gold Star parents, the Khans, after the Democratic convention. He has also demonstrated a marked inability to empathize with people suffering through difficult circumstances. In that regard, witness Trump's callous attitude toward Puerto Ricans following the hurricane that hit that island a month ago. General Kelly approaches the issue with enormous credibility. In addition to having to make tough phone calls to family members of those killed in action, Kelly lost his own son in combat. Thus, he is a Gold Star parent himself. 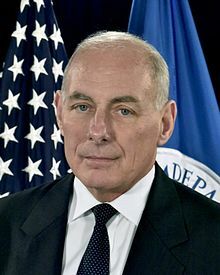 During the press statement, Kelly suggests that Trump's supposed uncaring attitude toward the Johnson family might have been simply a misunderstanding, the product of inartful communication by an inarticulate President. Given Trump's only passing familiarity with the English language, Kelly's suggestion that there was simply miscommunication is quite believable. The problem is that President Trump was the one who first politicized the issue. When asked at a press conference about the four soldiers killed in Africa, a fact Trump never had addressed publicly or privately, the President responded defensively and inaccurately, claiming that his predecessors often did not call or write the families of fallen soldiers. Thus, Trump politicized the matter long before Rep. Frederica Wilson appeared on the scene. Trump supporters argue that that the President should be given the benefit of the doubt regarding the words uttered during these difficult Gold Star family phone calls. Because the media refuses to do that, Trump supporters point to that as yet more example of media bias against this particular President. Balderdash. The reason Donald Trump isn't given the benefit of doubt, why the media is skeptical of his version of what happened during the Johnson call is not believed, is because the President has spent the first eight months of his Presidency telling one lie after another. Trump is like the shepherd boy in "The Boy Who Cried Wolf." In that story, the boy falsely claimed wolves were present so many times that villagers did not believe him when a wolf actually did arrive to attack his sheep. That legendary Aesop fable ends with the line uttered by a villager to the boy: "Nobody believes a liar...even when he is telling the truth." That is a lesson that the President should try to learn. Is it possible that the more successful the mission in Africa is (killing the terrorists) the less successful the overall goal is, reducing terrorism? Plus, then maybe the only thing the Special Forces know they are getting into is defending America in the unlikely event an invasion force crosses the Atlantic, Pacific, or Rio Grande? The Kahns? Really? You cannot see through the agenda, innuendo, the headline distortions from the main media? You try to explain away your bias by throwing in little tidbits of understanding of President Trump. List here what a Clinton presidency or any Democrat or more of the main Rinos would have brought to America? Tell us what your vision of America is? Communism sound good? Unfettered immigration with no borders or rules. Every wacko idea given credence? An economy bogged down under extreme regulations, unemployment and idle youth on legalized drugs? No one abiding by laws except the hardworking taxpayers? They step out of line, look out. Well that is what we had and as imperfect President Trump may be he sure did expose them for what they are. Marxists in Democrat clothing. This constant picking over every little word down to the point of a condolence call is just an example of what is going on in the backround to keep America going in the old Obama direction. Why do you fall for it? Guest, better question is why you insist on falling for a two bit con man, a lifelong liberal no less. All those issues you mention, Donald Trump has been on both sides. Donald Trump has demonstrated time and time again he cares only about himself and is simply telling his collection of Kool-Aid drinkers what they want to hear. Donald Trump doesn't care one bit about this country and the American people. He is as far from being a patriot that one can be. Obama (the New world order Marxist ) the biggest con man of them all had all the fancy words along with all the other glib talkers yet we saw the results of his 8 years. Obama did the opposite of what he said and it was totally ignored by media. He did zero for the country which barely survived after his style of "caring". Lets see I guess all the things you dislike that President Trump has done includes Gorsuch, TPP withdrawal -dismantle stifling Obama era regulations, enforcing immigration laws, and more, (often found on the back page bottom corner so as not to give him credit). (Imagine if he had some help with fixing healthcare etc) but I guess those things are imaginary since as you say "he demonstrated time and time again he cares only about himself" and we are blindly sitting here like dummies believing him. If that's a version of a "two-bit' con man" I'll take him any day. I say you are blindly spouting what you hear from main media which seems to concern itself with tabloid enquirer style reporting (Oh, we don't like the way he tried to console-what a cad) rather than thoughtful discourse on actual issues. McConnell, not Trump, is responsible for Gorsuch. We wouldn't have had Gorsuch without McConnell. But any other Republican President would have appointed Gorsuch, and we would have had someone competent in office unlike Trump. Withdrawing from TPP was far from an accomplishment. It was an extremely detrimental move for this country. American consumers benefit from free trade. By withdrawing from TPP we conceded that market to the Chinese. Smart? Not even close. Obama was famous for his deportations. There has been a negative flow of people coming from Mexico for years, long before Trump assumed office. So many things you want to give Trump credit for is simply because he is occupying office at a particular time. Trump has gotten zero legislative accomplishments in 8 months with a Republican-controlled Congress no less. Reagan passed major legislative measures while the Democrats controlled the House. Trump has taken no action to counter Russian meddling in our elections. He wants to pretend like it doesn't happen. Last time I checked, Obama and Hillary are not President. The buck stops at Trump's desk. He has been a complete failure in office, easily the worst President in my lifetime. We Republicans are going to pay a huge price for him in 2018 which will could very well lead a Democratic House impeaching Trump. We Republicans could only be sol lucky The only way we Republicans get over electoral disaster for the next 20 years is to move beyond the Trump fiaso as soon as possible.